The Caustic requires determining the Center of Curvature (COC) within 0.001". A difficult task (1 - page 223). With the LWT (3) each zone needs to be measured mechanically to better than 0.0005". A difficult task unless the room temperature is closely controlled i.e., distance from the mirror to tester changes with temperature while the readings are being taken. SIT employees a Caustic type mask, each mask hole returning an images of the testers slit, which by the way is visible in an eyepiece. But unlike the Caustic, all the mask holes are open allowing the capture of all the LWT measurements with one exposure. Lens mounting to CCD spacing (4). The slit image whether film or CCD is processed exactly the same. 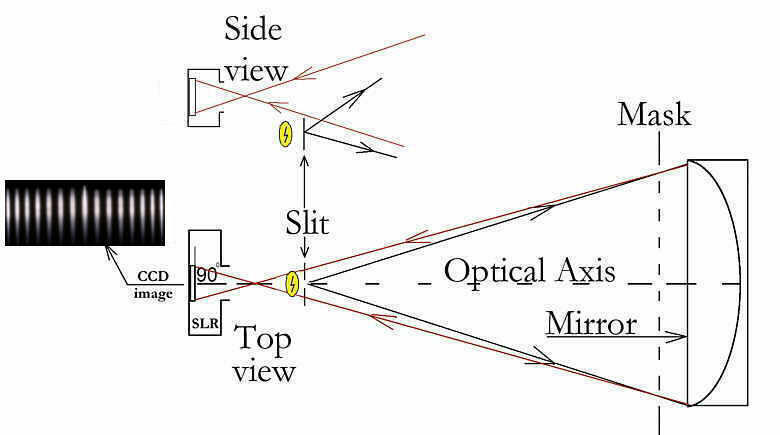 NOTE: The Slit or CCD or both can be in front or aft of ROC. LWT experts recommend both in front, avoiding the confusion of which ray belongs to which hole (behind ROC the rays cross the optical axis). My setup has both aft of ROC because of the way the camera is attached to the tester. That forces both to be behind where the outer hole ray becomes the outer slit in the image. Align tester to optical axis using the pre-aligned laser. Position tester to fill CCD with the Slit image. Upload the Slit image to the computer. Narrow Slits by increasing contrast (Image->Adjust->Brightness/Contrast). However for ImageJ to accurately compute the Center of Mass, the image must to be properly exposed. The proper exposure of the image can be verified by examining the image's histogram either in the camera or in ImageJ. Analyze->Histogram in ImageJ will display the Histogram plot. Clicking "List" will generate a list of brightness levels and the corresponding pixels at that level, with 255 being the Max brightest level. The exposure should be such that there are no pixels at that Max 255 level. However, there should be a number of pixels close to that Max 255 level. With digital cameras, pixels which are at the Max are displayed as flashing bright spots, which alerts to over exposure and the loss of information i.e., "clipping". 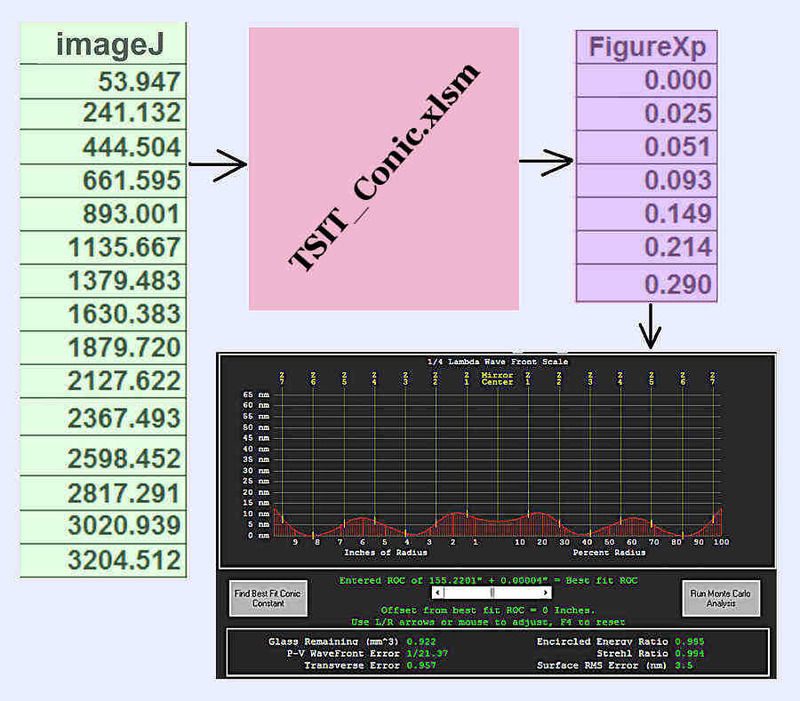 To compute the mirrors Foucalts, input ImageJ's Slit Center of Masses into the SIT Conic spreadsheet.